The Well of Sychar is a meeting place. It is the place where Jesus met the Samaritan woman. The place where a Jew met a Gentile. Where a man met a woman. The place where clean met unclean. Where a woman became an apostle to her people. Wells in the Bible are often the place at which unlikely people met and conversed. This well is Jacob’s well, hewn out of the rock by Jesus’ and the Samaritan woman’s common ancestor more than a thousand years earlier. A place acknowledged today by Jews, Muslims and Christians. It is the place of life-giving water for people and flocks. It is a place of life-giving news. I am an ordained Episcopal priest. I spend a lot of time thinking about the brokenness of humanity and how we create healing with God’s help. I think about the chasms that separate us and how we recognize the humanity of those whom we perceive as different or “other.” The language we use and the places we meet (in both the physical world and the cyber world) are important. What we say about and to each other matters. Kindness and compassion matter. Words can hurt and words can heal. There’s whole a lot of hurt in the world that needs healing. So let’s start conversations that contribute to the healing. Let’s find our Wells of Sychar where we can meet. For more on my thoughts on this lovely passage from John’s gospel, please read my sermon on the woman at the well. 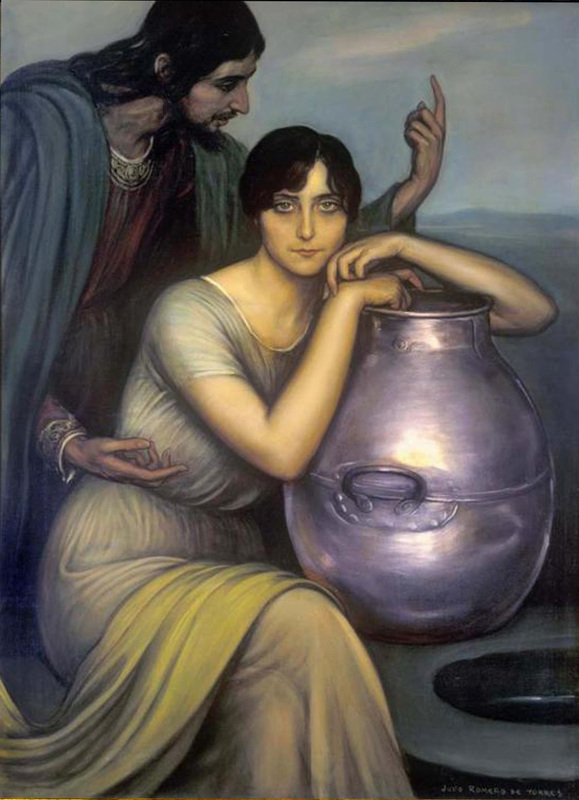 Photo: Christ and the Samaritan Woman. Romero de Torres, Julio, 1874-1930. Art courtesy of the Jean and Alexander Heard Library, Art in the Christian Tradition (ACT) database, Vanderbilt University. He left Judea and started back to Galilee. But he had to go through Samaria. So he came to a Samaritan city called Sychar, near the plot of ground that Jacob had given to his son Joseph. Jacob’s well was there, and Jesus, tired out by his journey, was sitting by the well. It was about noon. Many Samaritans from that city believed in him because of the woman’s testimony.